Source: Cecil J. 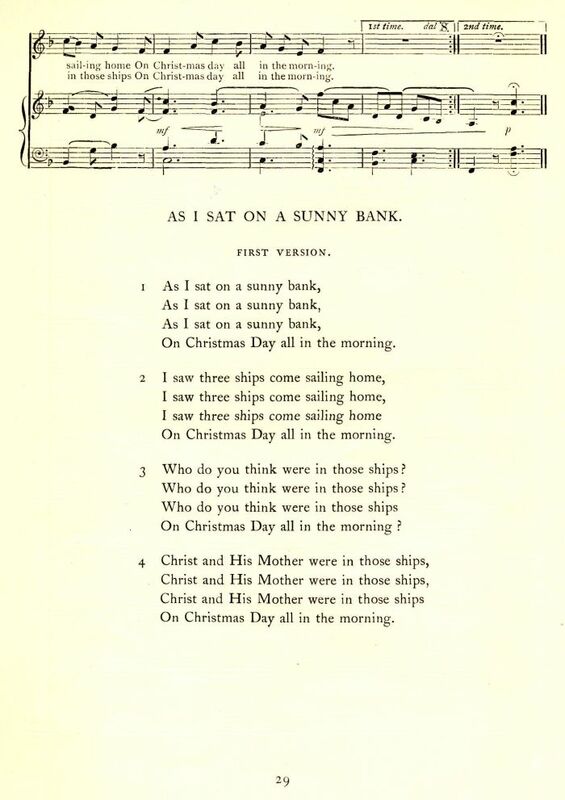 Sharp, English Folk-Carols (London: Novello & Co., Ltd., 1911), p. 28; This is the first of three versions printed by Sharp in this volume. On Christmas Day all in the morning. I saw three ships come sailing home. 3. Who do you think were in those ships? Who do you think were in those ships? Christ and His Mother were in those ships. 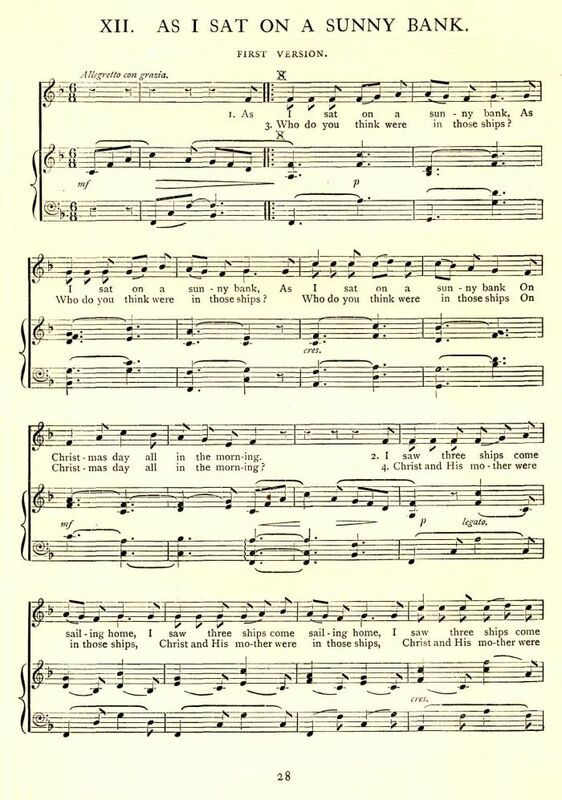 The first version was sung to me by a whilom resident of Wootton-under-Edge (Gloucestershire) as it was performed by the children of that village many years ago. The words are given without alteration. The second and third versions were sung, respectively, by Mrs. Beachy and Mr. Grimmet at Shipston-on-Stour (Worcestershire). Mr. Grimmet’s words are printed exactly as he sang them; one small change has been made in Mrs. Beechy’s words— “were” for “was” in the third stanza. The tune of the second version will be recognised as a variant of the well known “Nancy Dawson” air. Mr. Grimmet, having presumably forgotten the proper air, sang his words to the hymn tune “Sun of my Soul”. The words of the second version are almost exactly the same as those printed on a broadside by Wadsworth of Birmingham. The text of the third version is different from all the published versions that I have seen. The carol is very widely known. Traditional versions with tunes may be seen in Sandys, Bramley and Stainer, English County Songs and elsewhere. On Christ’s sonday at morn.